This Mamar speaks of a verse in this week’s Haftorah that discusses the exile and the means of redemption. The verse states that Tziyon, Zion, will be redeemed with Mishpat, judgment, and Shaveha, the captives, will be redeemed with Tzedakah. The Mamar examines the meaning of Zion, what it refers to, and how Mishpat redeems it. Through doing so, the Alter Rebbe enters into a discussion of the order of the soul’s descent below, its purpose, and goals. He then touches on the core of the spiritual exile that we experience and how we can remove ourselves from it. In a famous talk on 28th Nissan, 1991, the Lubavitcher Rebbe stated, “I have done all that I can…” and lamented the central fact “that we are in exile in Avodas Hashem”. 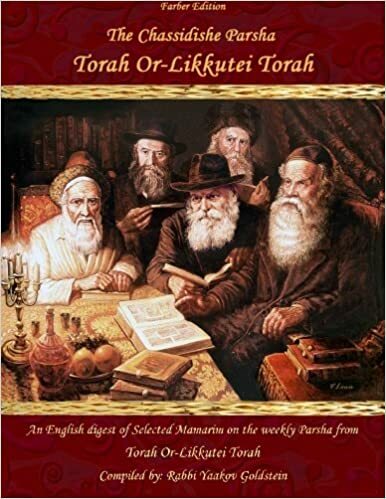 This Mamar sheds light on the essence of this spiritual exile, which the Rebbe so bitterly pointed out in that Sicha. Leaving this spiritual exile will certainly hasten the Ultimate Redemption. 1. How can we serve G-d with fresh and new excitement each day? 2. How did the soul descend into the body? What stages did it have to pass through? 3. What is the Avoda demanded of the soul below? 4. What is the level of soul, referred to as Tziyon, that is in exile and what is the level of the soul that is in captivity? What is the difference between exile and captivity? 5. How do we remove our soul from the spiritual exile? The Torah commands us to view the Mitzvos as if they are new each day. This means that one is to act with the same novel enthusiasm each time one performs a Mitzvah, as if it were the first time doing so. How is this possible to accomplish? This matter can be understood through first resolving the seeming paradox behind the descent of the soul into this physical world. Prior to its descent, the soul was bound to G-d, as is known that the souls existed prior to the Six Days of Creation and derive from G-d’s level of thought. The Sages state, “With whom did He discuss the Creation? With the souls of the righteous”, and all Jews are considered righteous. It thus remains to be understood: what benefit exists for the soul by descending below if it was already united with G-d prior to the descent? To understand this, we must first examine the order of the soul’s descent and its required Avoda, as illustrated within the prayer of Elokai Neshama. Each morning upon awakening, we recite the prayer of Elokai Neshama, which includes the stages of descent of the soul below. In the times of the Talmud, this prayer was said immediately upon awakening, even prior to Asher Yatzar. We first state that the soul is pure, Tehorah Hi. This means that the soul derives from the level called “Tehiru Ilaah (Supernal Purity)”, in which the state of the soul is absolute G-dliness. We then state “Barasa”, which refers to the transforming of the soul into a created entity so that it can feel separate from G-dliness and hence serve Him. “Veata Mishamra Bekirbi” means that Hashem guards the soul within the body so that it does not abandon or escape from the body. The next segment of Elokai Neshama discusses the first level of Avoda required of a person. There are three different Avodas required of the soul in the body: Hodaah, Bracha, and Ahavas Hashem. The Avoda of Hodaah is a person’s obligation to recognize that Hashem’s opinion is the correct opinion. On which matter do the souls and Hashem argue? Only on the perspective of “ex nihilo”. From the human angle, we view ourselves as the true existence and call Hashem “Ayin/nothing”, thus forming the concept of Yeish Meayin. We feel that we truly exist and it is Hashem who is not seen or fathomable. In other words, we see ourselves as more of a tangible reality than G-d. However, Hashem views it the opposite way: He is the true Yeish/existence, and we are the Ayin, being naught and nullified to Him. Therefore, we have to admit that Hashem’s opinion is correct and that we are the actual Ayin and He is the true Yeish. This is expressed in the saying, “Modeh Ani Lefanecha”, which concludes the blessing of Elokai Neshama. Nevertheless, simply admitting to this fact does not necessarily change the person, as it is a matter of belief and a person can believe in something while simultaneously acting contrary to his belief. For this change to occur, the Avoda of Bracha is required. A Bracha refers to a blessing, which connotes revelation. It reveals the matter to one’s soul, hence changing one’s nature to be in tune with his beliefs. Yet it is only through engaging in Torah and Mitzvos that one can effectively bring this revelation of Bracha to his soul. However, in order for a person to go from the level of Hodaah (belief in Hashem’s oneness and our nullification), to the level of Bracha (revealing G-dliness into our souls), one must first incorporate the Avoda of Love of Hashem in between. How does one reach a state of feeling of love for G-d? A Jew must have a proper balance of bitterness and happiness in order to achieve love for Hashem. A Jew must have bitterness in his animal soul, which is in the left side of his heart, over the fact that he is entrenched within material desires and wants, and is thus distanced from desires for G-dliness. At the same time, he must have Simcha of a Mitzvah in the right side of his heart and be overjoyed by his unique ability to actually attach to Hashem when fulfilling a Mitzvah. The greater the feeling of bitterness that one has due to his distance from Hashem, the greater will be his feeling of joy when he contemplates during his performance of the Mitzvah that he is now attaching to Him. How can one be joyous from doing a Mitzvah, due to attaching to Hashem, if one does not feel anything at all during the Mitzvah? In truth, every Jew unites with Hashem whenever he performs a Mitzvah. However, due to the exile and coarseness of the animal soul, this is not felt. The revelation of this feeling of attachment is saved up for that Jew until the future times, when all the attachments that one accomplished during exile will be revealed to each soul. This is similar to one who has a chest of precious stones and diamonds that causes him to be overjoyed even when he does not currently see the treasure. The mere knowledge that he has this treasure saved for him causes him boundless delight. The same applies to Mitzvos, for in truth we are drawing these revelations into a treasure chest of sorts that will be opened in the future times. Nonetheless, the fact remains that even when contemplating this matter, many of us are still not brought to any feelings of love for G-d. The reason for this is because of the exile and captivity of the G-dly soul within the animal soul that shuts down its emotive aspects and prevents feelings of love from surfacing. This spiritual exile is expressed within the overt emotions of bitterness and joy that one finds in materialistic matters. The abovementioned feelings of spiritual joy can only be accomplished when a Jew’s feelings of bitterness and joy are focused on the appropriate G-dly matters. However, when his bitterness is in worldly matters, such as a lack of wealth, health, and children, while his joy is only in acquiring these matters, he is experiencing a classic case of exile of one’s G-dly spark within his animal soul. Now, this exile affects two aspects of the G-dly soul: its essence and its emotive traits. It is on this exile of the essence of the soul that the verse states, Tziyon Bemishpat Tipadeh. Zion here refers to the inner spark of G-dliness, the most inner part of the soul that contains an essential feeling of love and passion for G-d. This love is in exile and needs to be redeemed. The later part of the verse, Vishaveha Betzedaka, refers to the power of emotion of the G-dly soul. This emotion has been taken captive and is now actually being used for the animal soul, just like a prisoner of war that now works to build the enemy’s infrastructure. As a result, the emotions of the G-dly soul, which should have been in use for bitterness caused by distance from G-d and a delightful desire to cleave to Him, are now being used for bitterness in lack of worldly pleasures, and in enjoyment of materialistic matters. The above is a parable for our dilemma of exiled feelings of love for G-d. Our animal soul is like the cold parents that the father experienced in his own upbringing. The animal soul teaches us to have feelings solely for physical and material matters and is completely cold and turned off to feelings of spirituality. It even causes the natural feelings of love in the G-dly soul to be suppressed and exiled. The animal soul’s emotional indulgence in worldly matters is similar to the workaholic father whose situation hinders him from any ability to invest mental energy into developing feelings for his children. The constant indulgence in worldly matters simply prevents one from activating the mental energy necessary to develop a feeling of love for G-d. The verse states that Zion is redeemed through Mishpat. This refers to the laws of the Torah, Mishpatim. It follows the dictum of the Sages that, “The exiles will be gathered only in the merit of the Mishnayos”. Thus, learning Halacha has the special capability of redeeming the spark of G-dliness from exile. The emotive traits, however, are redeemed through Tzedakah, as when one has mercy on another, this causes Hashem to bestow mercy on him and redeem his emotive traits from captivity. Can we really remove our souls from exile just by learning Halacha and giving Tzedakah? Many of us do both and still struggle to reach a tangible love for G-d! What is the meaning of this Mamar?!? The above antidotes offered by the verse are not meant to suddenly bring a rapturous feeling of love towards G-d out of thin air in the middle of one’s day. What it can do is sensitize the feelings of the G-dly soul and remove it from its exile. It is similar to placing an electric device into an outlet. If one does not press the “on” button, it will remain dead just as before. Even with the above services of learning Torah and giving charity, the G-dly soul must still be turned on by contemplative thoughts of matters that cause one to desire and long for G-dliness. It is with these two points together that one truly removes one’s soul from exile and brings it to a personal redemption. · Understand that the core of the exile is the spiritual exile of the emotive expression of one’s G-dly soul towards G-d. Develop a plan for soul-nurturing to allow your soul to regain sensitivity and feeling for Him. The antidotes to doing so, as explained in the Mamar, are charity, learning Torah, and contemplating matters that develop your love for Him.